Culms: Erect or decumbent at bases, simple or branched below, flattened or grooved on 1 side, glabrous. Blades: Flat or rolled inward, 2 to 10 inches long, to 1/4 inch wide, glabrous below, rough above; margins whitish; tips tapered to slender points. Sheaths: Open, glabrous or rough, collar with conspicuous tuft of long white hairs. Inflorescences: Panicles, bases enclosed in upper sheaths or sometimes entirely enclosed in sheaths; exposed portion spreading at maturity; branches slender, scattered, to 3 inches long. Spikelets: Short-stalked, crowded near ends of main branches, about 1/10 inch long, 1-flowered, pale purplish to lead gray; awns absent. Habitat: Open disturbed areas, pastures and roadsides, most abundant on sandy soils. Forage Value: Sand dropseed is grazed by livestock during its early growth stages, but it becomes unpalatable with maturity. It has little forage value for wildlife, but some birds and small mammals eat the seeds. Uses: The Apache, Navajo, and Hopi used the seeds to make bread. Comments: Tufted. 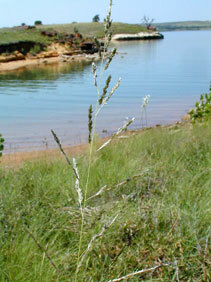 Sand dropseed increases in overgrazed pastures.